Fact or fiction? It is the truth presented as a gripping memoir, narrated by the youngest American kid, John, now a senior citizen living in California. Its focus on a child’s perception of events tells more about daily village life than most published works on the period. The book is, indeed, a tribute to WWII’s children, their mothers, aunts, and other village women. The Church and their deep faith in God kept them going at a time when many men had either died in the war or, as resistance fighters, fled to the mountains to defend their country against a desperate Nazi army searching for them, and to search for stranded British soldiers, food to eat, and for whatever possessions German soldiers could swipe. But by no means should Constant’s writing be categorized as “kid-lit.” Having taught elementary school in Chicago suburbs and in a California gifted students program, Constant is highly qualified to write from this perspective. She knows how children think, observe, and understand. Born in Chicago to Greek immigrant parents who harshly endured the depression years, Constant understands the problems ordinary Americans experienced in the1930s, as she wrote in her first book, Austin Lunch, Greek American Recollections. In American Kid, she returns to Chicago. The father of the story is Andrew, an early 20th century Greek immigrant who had lost his restaurant in Geneva, IL, during “hard times” and moved his wife, Katherine, and their three children to Chicago. Unable to find full-time employment and unaware of developing WWII in Europe, Andrew naively decided to send his family to Kalamata, Greece, temporarily, for a better life in 1937. He and his brothers owned a citrus grove in Kalamata that he thought would provide them income. Katherine compliantly agreed. She longed to see her family in Parnion, an isolated village in Laconia's mountains, northeast of Sparta, where, lacking a dowry, she had left 17 years earlier. When Katherine and kids left the U.S. Alex was 11, Nikki, 5, and John, 4. Andrew remained in Chicago to find a permanent job. The Axis bombing of Kalamata and of the church the family was attending on April 28, 1941 ignited Katherine’s desire to flee to Parnion, her village. She packed up Nikki and John and their few possessions, believing they were going to a safer place. Alex, a sea scout, likely to be arrested for his clandestine pro-British activities, was afraid of compromising his family’s safety; so he set off on his own for Parnion. Katherine was mistaken. The long and exhausting getaway to Parnion did not get them further from the Germans, as she had thought, but closer. Moving into her grandfather’s abandoned, neglected house and making it livable was just the beginning. A bag of lentils given by her cousin as a house warming gift was also a warning. Beloved sisters, relatives, friends, and Katherine’s faith offered help, love and consolation, but life did not get easier. With Andrew’s financial aid cut off, there was no money. Village homes had no running water, no electricity, no indoor bathrooms, no telephone, no radio, and no newspapers. Eight-year-old John daily hauled containers of water from the village fountain into “Grandpa’s” house. St. George’s church bell served as Parnion’s main source of communication. Constant is good at explaining the details of the villagers’ survival. Hunger and starvation were a huge issue. With a large, ailing, elderly population and a small number of men remaining, women and children were left with the task of finding and producing food. Katherine and John wandered the mountainside searching and collecting leaves to feed their goat, Bebba, John’s cherished companion and pet, whose milk was soon to be their major source of food. Parnion responded in horror to the appalling processions of approaching Nazi vehicles and soldiers searching for andartes and British soldiers hiding in nearby caves. Hungry themselves, Germans plundered villages of remaining food and property. Horrified, John watched them rip up his painfully planted potato field. Along with food, Nazis confiscated Parnion’s only car. Donkeys, mules, goats, sheep, and chickens disappeared from the village, as Constant beautifully relates. Alex’ assistance to hidden British soldiers became a danger to himself and his family; he fled on foot for Athens where his father’s brothers could protect him. One day, Nazis knocked on the door and demanded that Katherine show them her house. Germans moved in, relocated the family to a small room, and stayed for days on numerous occasions. Nikki in particular was terrorized by the event. After Alex’s departure, Nikki left Parnion to live with relatives in another village, where she could be better fed and protected. Nine-year-old John, now the man of the house, was still a child who delighted in the beautiful mountains, the companionship of his cousins and friends, and Bebba, his beloved goat. He warmly recalls spirited dancing at pared-down weddings and church celebrations that still occurred in Parnion, in spite of the war. They were special occasions which provided some slight morsel of food to the hungry and starving, barefoot American child--all expressed in fascinating detail by Constant. John recalls much about his beloved, 1940s Parnion, both upbeat and tragic, as he also experienced scenes we would deem inappropriate for children today. In horror, he, his mother, siblings, and neighbors desperately escaped village environs to hide in a stinking goat corral the first time Nazis arrived. He witnessed the tragic deaths of village elders; the parading, through the village street, of bodies slaughtered by the Nazis, including two teenage boys John knew personally. He recalls the day the Nazis arrived to set fire to Parnion, including Grandpa’s house. The family finally returned to the United States and to Andrew in February of 1946 to begin their new lives in Ann Arbor, MI, where Andrew had established a successful business. John, Katherine, Nikki, and Alex had much to share with him about their eight-year Odyssey. 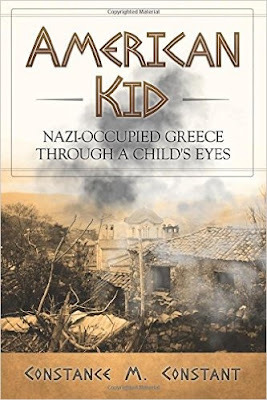 This amazing account of the horrors and terrors of war as experienced by children should be read by people of all ages, ethnicities, races, and religions. We are grateful that this account has now been shared with us, thanks to John and Constance M. Constant.